We’ve wanted to try Coentro since chef Joao Faraco opened the restaurant. He was voted the best chef in The Canaries last year, and we had the pleasure of being taught by him at Cook In Lanzarote when they ran a special course on Brasilian cookery. If you want the headlines only – excellent service, good value, sensational food and an average location. Coentro is located in the parade of shops opposite Faro Park at the lighthouse end of Playa Blanca. Location is the only aspect that lets the restaurant down – it’s a fair way out of town and the only view is of the road and houses across the road. There is a small outside area on the pavement, with glass wind screens, and the main restaurant is a simple oblong, brightly lit, and with a large bar area and visible kitchen. You’re given two menus when you walk in – one for the various tapas dishes on offer, and the other for the tasting menu, which we went for, and which consisted of seven courses. The service is really good – we were looked after by two waiters, who were always there when we needed something, and who explained each dish in detail as they served it. The crockery, which isn’t something I’d normally mention, is really special. Obviously hand made, and consisting of all kinds of interesting shapes and colours. We loved the way the waiters weighed up the dish and who it was for and then served it on an appropriate plate! 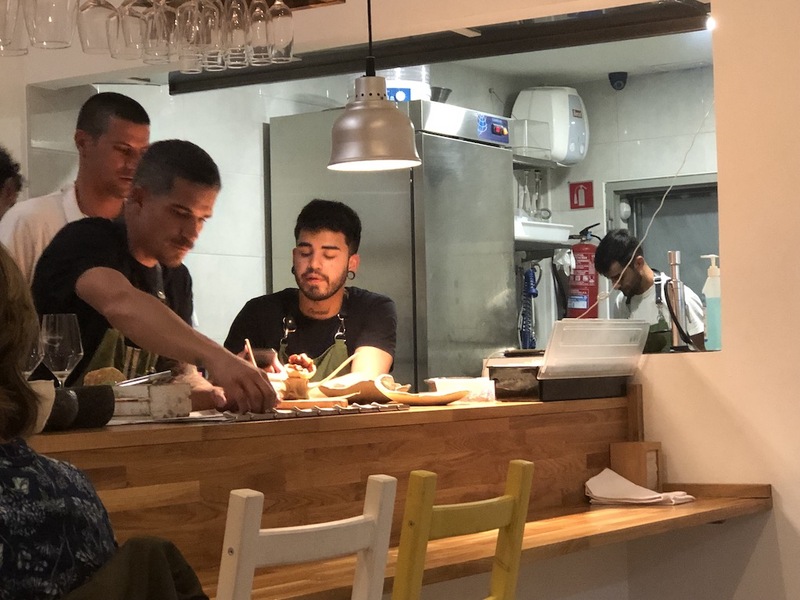 We ordered a bottle of wine from Bodega Guigan, and that was served with a small pre starter on the house – a spoon of raw red tuna (in season right now) and a little fried arepa. We were also served bread, with some really peppery olive oil and local sea salt. The first of the starter courses arrived next – tomatoes from Tinajo with prawns. The tomatoes were served as a perfectly seasoned, super smooth cold soup, with beautifully cooked prawns, crunchy garlic croutons and a swirl of olive oil – what a start! This was followed by Cod Fritters. These were small balls of battered, fried cod, which was so succulent. They were served with Bikini Truffle mini toasts, that were just sensational. Brie cheese and a truffle butter lightly toasted and served wrapped in paper. The final starter was an egg which had been poached for an hour at 65 degrees served in a green vegetable purée. The egg was still runny, and cutting into it, created a wonderful taste sensation of eggs and vegetable contrasting with a crunchy paprika crumb. After a well earned pause – the waiters seemed to sense we needed a gap – the first of the mains arrived. It was billed very simply as black hake – a fillet of hake in a black batter, served on a sweet potato purée, also black, with liberal use of squid ink. The hake was divine, the purée perhaps lacking a little in seasoning for my taste. The final main course was Beef with corn and peanut. It was a good chunk of beef, super tasty, but not as tender as I would have hoped, served with an amazing gravy (I should probably call it a jus) and a vegetable purée. We finished with two melon based desserts, notable for the perfect ripeness of the melon and the sharpness of the passion fruit. It was an exceptional meal. I urge you to visit Coentro before Joao disappears off the island to Michelin super stardom, because I’m sure he will. The quality of the ingredients, the innovative techniques and the superb pairing of flavours are really that special. Couple that with great service from the front of house team, and you have a real winner. The tasting menu changes according to the ingredients available, but is €35 a head, and that represents amazing value for money. Coentro is in Calle Irlanda 7, Local 28, Playa Blanca. Call them to book on 676 833 799. They’re on Facebook: Coentro.